MANILA, Philippines — Wonder ladies and women of the Manila tech startup community will gather on September 21-23 for the first-ever Women Edition of Startup Weekend Manila at Commune Cafe, Makati City. Themed “Build Startups in Female Inclusive Environment”, Startup Weekend Manila: Women Edition is a 54-hour programme from Friday night to Sunday morning that brings together designers, developers, entrepreneurs, and experts from all domains to transform startup ideas into reality. But compared to the usual Startup Weekend, the upcoming women edition has an all-women list of judges and mentors. Men are allowed to join, but only female participants are allowed to pitch in front of the judges and to lead teams. Startup Weekend Manila: Women Edition is part of a series of Techstars Startup Weekends across the Asia-Pacific this September to celebrate women, diversity, and inclusion in local communities. The initiative aims to address the barriers faced by women in the tech scene including lack of mentors and female role models in the field, gender bias in the workplace, unequal growth opportunities compared to men, and unequal pay for the same skills. The winning team at the Startup Weekend Manila: Women Edition will qualify to compete in a regional level (in-person) demo day with other winners of the same event from different cities in the Asia Pacific region. The finals and demo day is scheduled for October 20-21, 2018, in Bali, Indonesia. Aside from Manila, key cities in Visayas and Mindanao – Cebu City and Davao City, respectively, are also organizing Startup Weekend Women. The event is made possible through the support of Commune Cafe, Developers’ Society, WiTECH, Women Who Code Manila, J.V. Angeles Construction Corp., Beepbeep.ph, Alfox Printing Services, and Ideaspace Foundation. 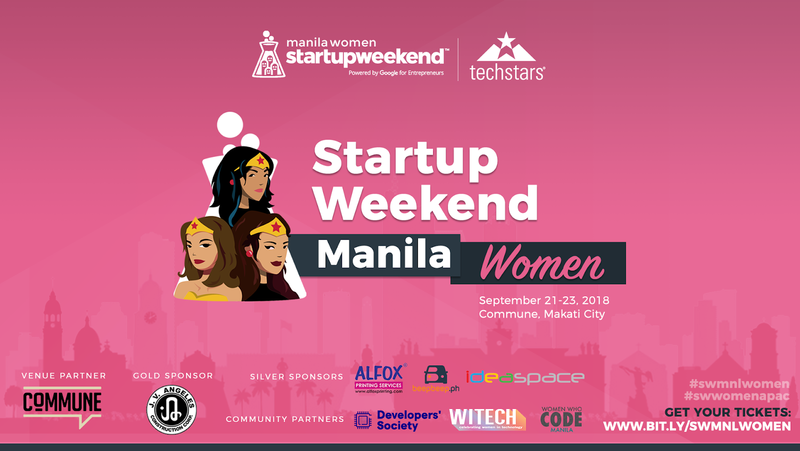 If you are interested to join Startup Weekend Manila: Women Edition, you can get your tickets through https://bit.ly/SWMNLWomen. For partnerships and sponsorships, email manila@startupweekend.org.